This article is for boards that were created before August 23, 2016 which had free Power-Ups enabled. Otherwise, see Enabling Power-Ups. 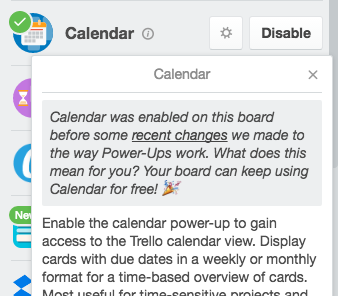 Boards created before August 23, 2016 with Free Power-Ups enabled will have any free Power-Ups that they had enabled grandfathered. This means that those Power-Ups will not contribute to the limit of one Power-Up on boards on free teams. If you try to disable a grandfathered Power-Up, you'll see a warning. 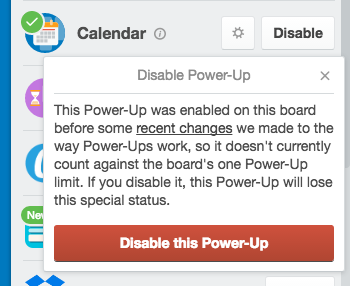 After a grandfathered Power-Up is disabled, it will count towards the free Power-Up limit.